Opis: A new mammoth telescope has begun to inspect the northern sky. 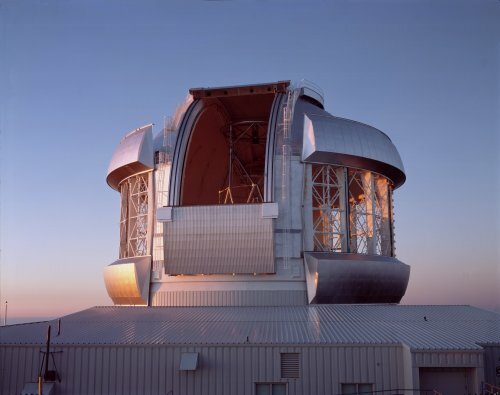 The 8-meter Gemini North telescope, pictured above, was dedicated last week in Hawaii, with images documenting its unprecedented abilities being released. Within two years, sister telescope Gemini South will begin similar observations of the southern sky from Chile. The Gemini telescopes will collect an enormous amount of visible and infrared light. In the infrared, a Gemini can resolve objects that even appear blurred to the Hubble Space Telescope. To achieve such high resolution, the Gemini's use adaptive optics, a technique that continually flexes Gemini's main mirrors to counteract the defocusing effects of Earth's turbulent atmosphere. A seven-nation collaboration is completing the Geminis under the direction of the US National Science Foundation.